Muhammad Abbas has come a long way from the days when he and his friends would strap rough wooden planks to their legs with nylon rope and go skiing. 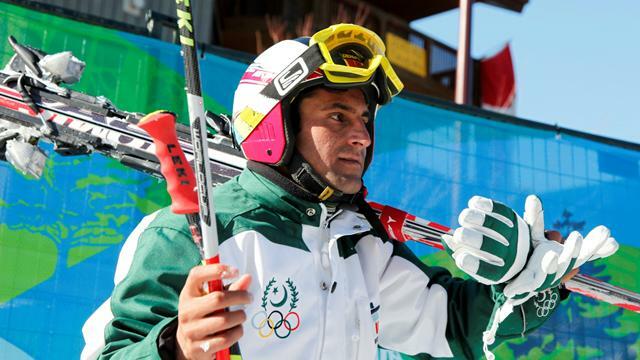 On Tuesday, the 24-year-old will become the first Pakistani to compete at a Winter Olympics when he starts in the giant slalom. His is a journey that has taken him from a life below the poverty line in a northern mountain village to the bright lights and glamour of Whistler - by way of Iran, Lebanon and Austria. Abbas, who in faltering English expressed to Reuters his excitement and delight on Monday, will be at something of a disadvantage against the mighty Austrians and Swiss. Not only will he be 96th of 103 starters, but Tuesday will also be his first race of the year. "In the last two years, we have trained only eight weeks," his 55-year-old coach, Zahid Farooq, said after a team captains' meeting. "We had two weeks in Austria in 2008 and six in 2009. "We have a very small slope in Pakistan that is only 500 metres long," he said. "The vertical drop is only about 80 to 100 metres, so we can't really train but we just keep ourselves in touch." Abbas competed in 10 races last year and is a beneficiary of camps organised by Alpine skiing's governing body, the International Ski Federation (FIS), to help developing nations. He has also been assisted by the Pakistani Air Force contributing from their welfare fund. The story began in 1996 when Farooq was posted to Naltar, near the town of Gilgit in the foothills of the Karakoram mountains, as a survival trainer. "Muhammad started skiing on home-made wooden skis," he recalled. "They don't have much resources to buy equipment so this was their pastime, what they did in their free time. "They would chop off some wood and chisel it, make it into thin bits to look like a true ski and they would tie it to their feet with rubber or with nylon rope. "Once we saw their passion for skiing, on their small skis with no ski boots, we arranged about eight pairs of skis for them," continued Farooq. "We held a trial and we picked 16 so they could share the skis - one group in the morning and one in the afternoon. From there, we picked up these boys and started sending them to Iran for the junior championships in 1999. "These boys hypnotised us," he said. "We are so much in love with their passion that we actually just got together and thought this has to be done." The 2006 Turin Games came too soon for Pakistan and even now, resources are severely stretched. Where others have coaches, managers and ski technicians, Pakistan have Farooq. "I also act as a physical trainer, I keep them on track and make sure they go to training...I am the cook as well," he said. "And if some equipment is required to be repaired, I do that. "I can ski reasonably well. Not competitive, but I can come down in one piece. That's what I did today," he said of Monday's piste inspection. Farooq has plans to add a female skier to the team for Sochi: "By the grace of God, we will by 2014," he said. "And I hope to have some Nordic skiers as well." Follow the Winter Olympics 24/7 on British Eurosport (Sky 410 / Virgin 521) and Eurosport HD (Sky 412) British Eurosport channels are streamed online via the Eurosport Player.